50-year-old terrorist tries to stab police officers in Jerusalem's Old City but is shot before harming anyone. Reports are coming in of an attempted attack on Wadi Street in center of Jerusalem's Old City. 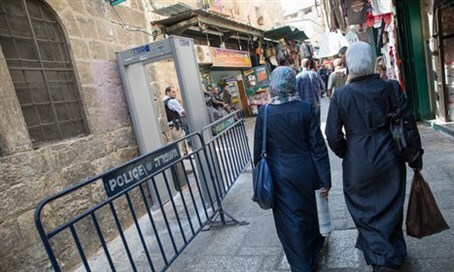 An early investigation found that the terrorist intended to stab police officers stationed on Wadi Street, but they reacted quickly and shot her before she could harm anyone. The terrorist was severely wounded, though no one else was harmed. The attacker is believed to be about 50 years old. Another attempted terrorist was caught near Jerusalem yesterday afternoon (Monday). She also was armed with a knife and said that she intended to attack security forces. Earlier yesterday, MDA noted that there have been 230 attacks since the current wave of terror began, including 97 stabbings, 24 car attacks, and 16 shootings.